Hauskaa lauantaita, tervetuloa Allsorts haasteen pariin! "Jotain muuta kuin jouluista" on teemamme kahden seuraavan viikon ajan! Pidämme siis ruhtinaallisen viikon loman! 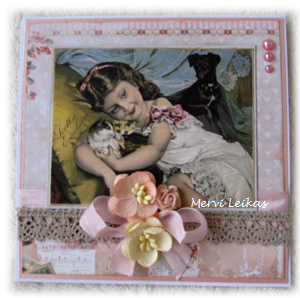 Warm and cosy vintage image, girl with animals, flowers, lace, ribbon, bow and pearls. Really lovely card with great embellishments. Lovely vintage image! Thanks for joining Brown Sugar Challenge! Be sure to check out our DT Call as well. What a lovely vintage card! That image is beautiful and the floral embellishments add so much. Thanks for joining us at TTCRD. Great card. Thanks for joining us at Brown Sugar this week for our "Anything Goes" challenge.